Learn more about the Business Management major and minor as well as the 3/2 Accelerated Management Program. 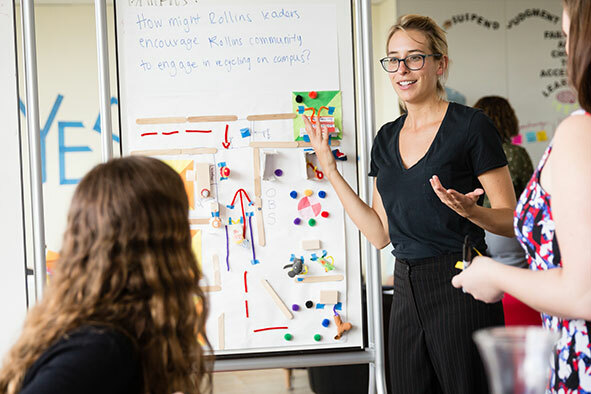 The Business Management program is rooted in Rollins' commitment to educate students for global citizenship and responsible leadership, preparing graduates to pursue meaningful lives and productive careers. Beyond business as usual. With an emphasis on sustainability and social responsibility, the Business Management major provides a solid foundation in business theory and practice, entrepreneurship, and innovation. This program prepares students to lead transformational change across a variety of business types. Students majoring in Business Management may also be interested in the 3/2 Accelerated Management Program at Rollins, which combines a four-year Bachelor of Arts (BA) and a two-year Master of Business Administration (MBA) into a five-year program. We are committed to infusing the Triple Bottom Line (People, Planet & Profit) into the program as evidenced by our participation in PRME (Principals of Responsible Business Management). Developed in 2007, PRME is an initiative to promote and inspire responsible management education and research in academic institutions around the globe. Dialogue: We will facilitate and support dialog and debate among educators, students, business, government, consumers, media, and civil society organizations and other interested groups and stakeholders on critical issues related to global social responsibility and sustainability. Learn more about the six principles of PRME.